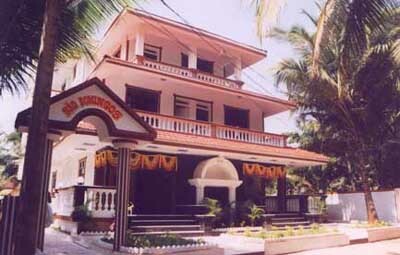 Sao Domingos is a 15 room Guest House established in October 1999 and personally supervised by its owner Edwin. All the rooms have either AC and fan or a fan, private balcony, shower and toilet facilities second to none. As the building is constructed of 'Marble' and is surrounded by palm trees it remains pleasantly cool, day and night. There is a small shop at the reception area for urgent requirements and Money exchange. Breakfast is taken on a patio at roof level at Al Fresco, with panoramic views of the river Sal and the nearby Arabian Sea with its miles of sandy, palm fringed beaches. This is within easy walking distance. Goan Village Restaurant is situated opposite the Guest House. We serve food of the very highest quality, with the selection of Goan, Indian, Tandoori, Chinese, Continental, etc. Any special needs can be catered for. There is a full range of beers, spirits, cocktails and soft drinks. We offer a comfortable, easy going and enjoyable experience in a fantastic surroundings.